Glen Dickson writes in Broadcasting & Cable about Sony and All Mobile Video’s plans for a new 3D production truck. It’s set to debut at NAB 2010. 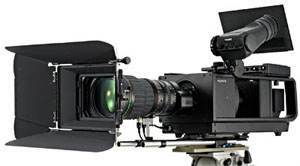 New York-based mobile production vendor All Mobile Video announced Monday that it will build the 3D-capable HD production truck; it’s expected to be ready to shoot 3D sports and live events this summer. However, using a 3D camera system such as the one Vince Pace developed for Jim Cameron for Avatar presents problems for mobile production, since the rigs usually employ two large HD cameras, making them large, bulky, and complex to operate. That might be addressed by Sony’s recently shown prototype 3D camera, demo’d at CEATEC JAPAN 2009 in October. The single lens 3D camera technology can run up to 240fps–such slo mo capability is de rigueur for sports, expected to be an early adopter of 3D technology. It’s not clear how soon the camera will come to market. According to Dickson’s article, the All Mobile Video unit will incorporate 3D camera rigs from 3ality Digital, which employ automated convergence technology. Pace’s rigs require live operators to tweak convergence on a shot-by-shot basis. Missed Panasonic’s announcement at CES that they would be delivering a twin-lens HD 3D camcorder by this fall. LIsting at $21,000, the PR for the camera adds “made to order” a least twice in the document, giving you an indication that they don’t expect these things to fly off the assembly line. Actually for rigs featuring such complex optic paths, everything ends up being hand assembled; Panasonic might be hoping too many orders don’t pour in before they can judge the market’s desire while coming up with a cheaper way to manufacture them. I’m not expecting All Mobile probably to be adding a Panasonic 3D camcorder to its new truck’s package anytime soon. But it’s interesting to see Panasonic and Sony staying toe to toe to slug it in the marketplace for 3D production gear. Wonder if Grass Valley will be matching this soon. With the expense of developing custom 3D optical rigs, smaller camera manufacturers have a tougher road. Expect to see third party partnerships to help keep costs down.